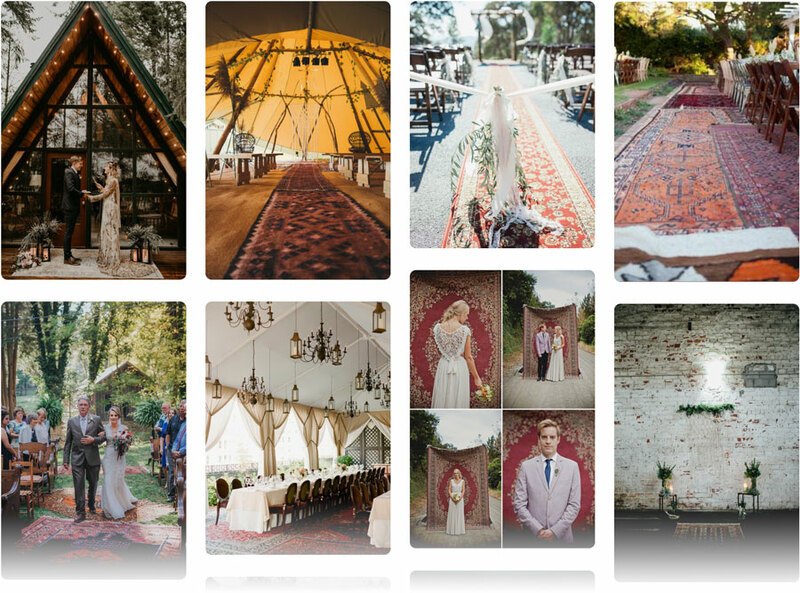 One emerging trend that we are absolutely loving is decorating the ceremony and reception space with rugs. Yes! You did read that right! Rugs can lend a deep sense of intimacy and richness to a space that would otherwise be bland and boring or can elevate a majestic place making it feel more cozy and welcoming. Who knew a rug had that much power? We did, of course! The great thing about using rugs as part of the wedding decor is the vast array of personalization it can give the couple. And it can work for just about any space, theme, and color combination chosen by the couple. From industrial to rustic to earthy to modern, the key to making this design trend work is knowing how to pair textures and patterns, and knowing where to place the rugs. 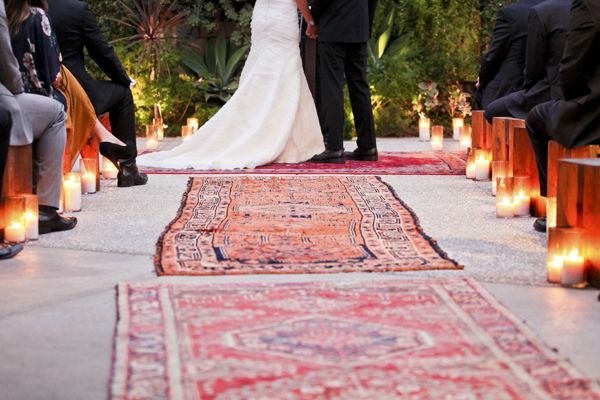 One common area to use rugs is for the aisle and altar during the ceremony. We suggest choosing different sized but similar shaped rugs in shades of white for a more modern approach or layering rugs with similar patterns and textures for a more complex design in an uncomplicated ceremony space. Less commonly used for the receptions, rugs can still find ways to make your reception unique and special. Create conversational areas using chairs and rugs and tables where guests can sit and chat during the cocktail hour. Or creating a unique cake table centered on a gorgeous textured rug. No matter how rugs are used in the wedding decor, the possibilities are endless and can be customized to the individuals liking, decor and space details. And the great news is, if a completely custom look is what you are going for, one that can be kept as a keepsake passed down from generation to generation, consider designing a rug through our Mafi Signature 16 Design Center. For more ideas check out our Cozy Wedding Ideas board on Pinterest! Mafi Rugs are handcrafted with the most care and attention to detail. The perfect choice as you make a lifelong commitment to the one you love!